You’ll be given a warm welcome when you arrive at the Exeter Harriers Clubhouse for your first club night. Our training nights are Tuesdays and Thursdays from 6.30pm for Juniors and from 7.15pm for Seniors and we are open throughout the school holidays. Currently Juniors (schools years 4 – 9) can come for a first session at any time. Seniors should email welcomedesk@exeterharriers.org.uk in advance or come for a chat beforehand. We offer new members a temporary membership for one month to give the club a try and experience coaching on many of the disciplines; running, jumping and throwing. You can attend as many of the training sessions during this period, as you wish, at the member rate of £2.50 rather than paying £5 charged to non-members. Please complete the attached Temporary Membership Form and bring it with you on your first session. Cost; please pay £2.50 at reception, just as you enter the clubhouse, and tell them it’s your first night for the junior session. If you prefer just to look around on your first visit there is no charge for this. Temporary Membership Form; you will then be directed to the Welcome Desk in the main clubhouse room who will take your temporary membership form and give you a temporary membership card. Training; The juniors go out onto the track at 6.30pm, normally the new athletes that night will go out with an assistant coach who will ensure that they know what is happening during the warm up (which is all ages together) and then ensure they are put into their respective year groups for their main session, if possible they will buddy them up with an existing club member. The main session could be sprints, endurance, hurdles, throws, jumps or sportshall agility. We try to rotate the year groups around the possible sessions on a weekly basis. Currently hurdles is only available on a Thursday. First visit; you are more than welcome to come and see what goes on at anytime but you will need to email (see above) to discuss the timing of your first visit/training session. It’s best to arrive about 6.45-7pm if you wish to have a discussion with the Welcome Desk/Coaches. Training; Split into specialist groups that train for a specific event; sprints, hurdles (currently only available on a Thursday) endurance, throws, jumps (we have a visiting coach for pole vault so this is not regularly available) or multi events organised through our jumps coach. Some of the groups may be full and places are not always available ESPECIALLY DURING PERIOD 1ST MAY TO 19TH JUNE (LOCAL, COUNTY & REGIONAL ENGLISH SCHOOLS COMPETITIONS) WHEN TRAINING PRIORITY WILL BE GIVEN TO EXISTING U15, U17, U20 CLUB MEMBERS. A temporary membership will last for one month and when it has ended you might consider joining Exeter Harriers to continue to benefit from the member rates and allowing you to be eligible to compete in our inter-club competitions and leagues. Speak to any of the Welcome Desk Team about this. 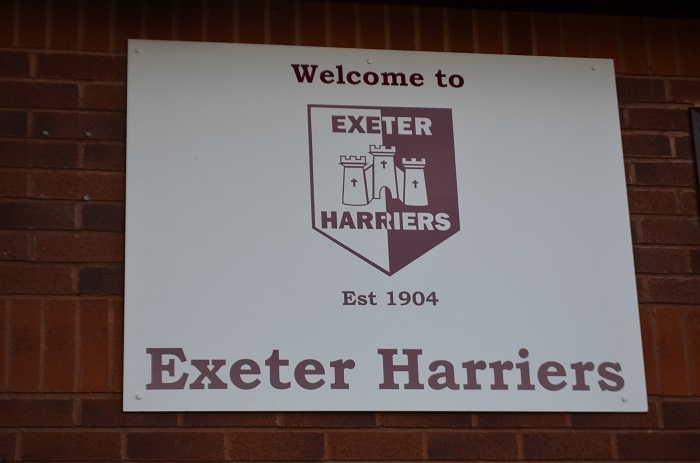 We look forward to seeing you at Exeter Harriers!